1. I love reading cozies because I like to solve puzzles. My pal, Carolyn Hart, once confessed that she feels the same way. It's fun to match wits with the killer, go over the MMO (means, motive and opportunity) of the suspects) and try to decide who committed the crime. Okay, true confession time. Sometimes I get it right, and sometimes I don't! 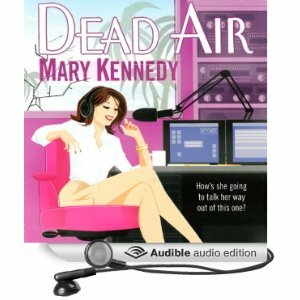 In book one, DEAD AIR, the first of the Talk Radio Mysteries, pictured above, Dr. Maggie is horrified when a guest is murdered right after her radio show. Who killed Guru Sanjay? There are certainly lots of candidates! 2. I love reading cozies because it's nice to see justice triumph in the end. In real life, we all know that sometimes life is unfair. Justice doesn't always triumph and the guilty party gets away with the crime. In cozies, there is a sense of rightness and justice. 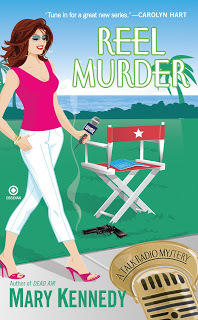 In my book two of my Talk Radio series, REEL MURDER, there's a murder on the movie set. We really want to see the guilty person punished! The victim wasn't a very nice person but she certainly didn't deserve to die. 3. I love reading cozies because I have a whole cast of characters I can identify with. And since most cozies are written as a series, I can see how my favorite characters develop over time, how they change, how they grown, how they face new challenges. 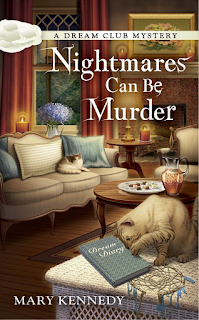 In Nightmares Can Be Murder, the reader is introduced to a couple of sisters who open a vintage candy store in Savannah. And we're caught up in the Dream Club, a fascinating group of characters who meet once a week to share their dreams and solve a murder or two. Readers tell me they eagerly await each book to see what's going on with their favorite characters. How about you? Why do you love reading cozies? Please take a moment and share your thoughts. I know we have a lot in common!